Description: like almost all of Hasbro’s medium sized dinosaur models, this electronic Tyrannosaurus doesn’t stand in a neutral posture. It's posed in a bent position, head, arms and tail positioned to the right, in a walking mode with the left leg posed forward and right leg backwards, as if circling potential prey. It has a large dino damage wound on its right flank, revealing red muscle tissue and white ribs. Inside this wound a button is located: when pushed it activates a rather high pitched growl. A second button is placed on its throat. Pressing this button produces a fierce attack roar, and makes the jaws open. Both the arms and legs are fully poseable. This T-Rex features a fairly intricate paint job. Its underside (lower jaw, throat, belly, lower part of the tail, underside of the arms and inner part of the legs) may be plain beige, but the sides of the animal (sides of the neck, flanks, back parts of the arms and legs and sides of the tail) are coloured brightly green instead, and the top parts (neck, back, upper part of the tail, forward sides of the arms and legs) are painted yellowish brown with dark brown stripes. The face and top of the head is bright red, while the area around the lower jaw is coloured a darker shade of red. The Rex has small yellow eyes (with black pupils), white teeth, a pink tongue, a red inside of the mouth, dark grey claws on both fingers and toes, and a white JP logo on both upper legs. 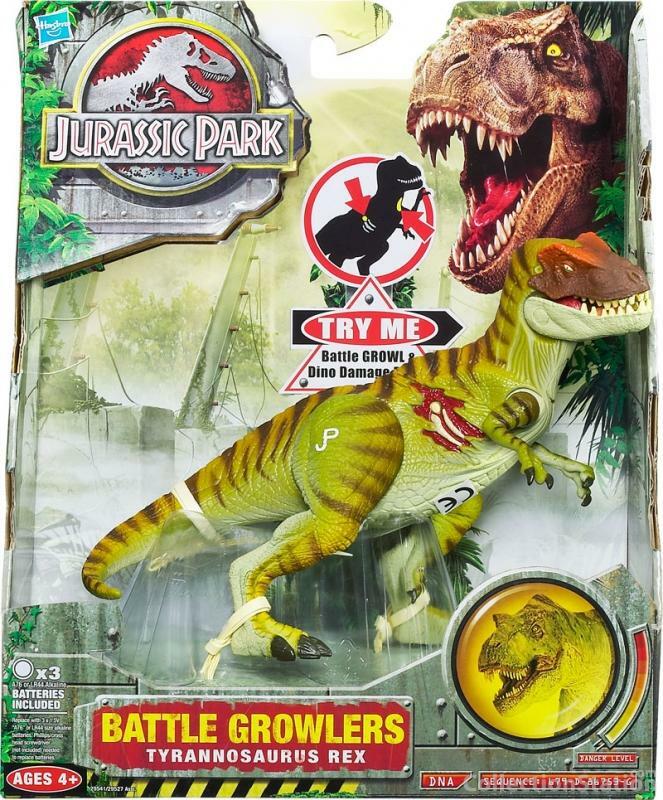 Analysis: despite the overt abundance of little Rex sculpts and the presence of a huge Tyrannosaur figure in this toy line, Hasbro also felt the need to repaint this often used medium sized Rex sculpt once more, making this the most T-Rex intensive JP line so far. Few people would have lamented its absence, but if it was missing from this line they would have missed out on a pretty neat paint job. If red has been used to colour the flanks instead of green, it would have been very tiger like. The use of many stripes coupled with green and brown colouring gives this animal a distinct jungle feel: one could see this as an attempt at an unofficial Camo-Xtreme Jungle T-Rex. Details have been taken care of, including all the claws, and the difference in colour between the tongue and the inside of the mouth is a nice touch, hardly ever done before. The face and the top part of the head being coloured so separately feels a bit odd and out of place, but it harkens back to the good old Camo-Xtreme Arctic T-Rex which had a similar thing going on (it worked better in that figure's case though). Apart from the appealing and colourful new paint job, there's little of interest to this figure. The posture it assumes is still a nuisance if you want to play with, the biting action which needs to be activated by an inconveniently placed button has little practical effect and the huge gaping wound on its right flank is still bloody annoying. But once again, we have proof that a solid paint job alone can make a sculpt look much better than it actually is. Repaint: yes. This is a repaint of the JP III T-Rex figure (Wave 1). It has been repainted several times before for Camo-Xtreme, JPD2 and JPD3. Overall rating: 6/10. A half decent sculpt, but a pretty good new paint job making it look much cooler. This dinosaur figure is not at all rare and can still be found easily. Since this set was a Toys'R'Us exclusive that could change over time, but probably not for the next few years.